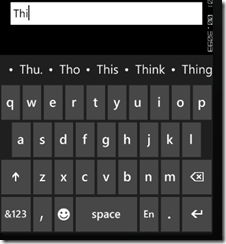 In a previous post I wrote about some tips for creating WP7 apps which included using the CameraCaptureTask. A reader responded, asking how to save the picture. So I figured I’d write a more detailed response with some samples. How to simply use the camera and display a photo. How to save an image to the phone’s media library. All of these are pretty simple. I’m sure once you get started you can easily modify this code to do more creative things. First, you’ll need to define a CameraCaptureTask. You should always do so as a class level variable. You should also wire up the Completed handler in the constructor These steps are important for dealing with application tombstoning. For more on this, please read this article. You’ll need to kick off the camera task, I’m using a button. In this case I want to save the image to IsolatedStorage. In addition, the app I was creating didn’t need full size images. So I figured, why waste space in the user’s IsolatedStorage? So I use a WritableBitmap and change the size of the image. You’ll notice that after I save the image, I read it back and bind the results to another image named SmallerImage. That’s just to prove that saving it really worked! //here I save the image to Isolated Storage. Also I am changing the size of it to not waste space! Hopefully you’ll see that using this feature is pretty easy. Posted in .Net, C#, Silverlight, Windows Phone 7. 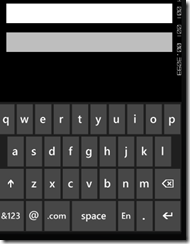 I recently started writing my first Windows Phone 7 Application. I was shocked at how easy it was to get started although I’ll admit that has a lot to do with my existing knowledge of Silverlight. If you don’t know Silverlight, now is a great time to learn it. You can write apps for the web, desktop, and Windows Phone 7 too! As I wrote my application, I compiled a list of tips to share. I spent a bunch of time tracking some of these down or figuring them out. I hope this will be helpful to other people. Plus, I’ll use this as a reference for myself when I create my next app! Here you go. The first two are pretty basic, but worth mentioning. The best advice is to install the tools and try it out for yourself. If you create an application from one of the templates (you’ll get them after you install the tools for Visual Studio) you find that the templates themselves are a great learning tool. Some include samples for styling, data binding, design time data binding, navigation, and more! I recommend trying each of the templates out. This isn’t really a tip. You can’t create apps without doing this! Visit the App Hub to download the free tools. You get all this for free: VS 2010 Express, the Windows Phone Emulator, Expression Blend for Windows Phone, and more! Also, don’t forget to install Silverlight for Windows Phone Toolkit from the CodePlex site. It includes some additional controls that are great like AutoCompleteBox, ContextMenu, GestureListener and more! By the way, when you are at the App Hub, check out all the great learning resources. By the way, you should keep in mind that Windows Phone 7 is a subset of Silverlight 3! That means that most features of 3 are there but not all. And Silverlight 4 features are obviously not included. The first screenshot is the SIP when the EmailNameOrAddress version has focus. In the second screen shot (TextBox InputScope set to Text), I typed a few letters and you can see the word suggestions! If you want your application to support both portrait and landscape mode (when the user tilts the phone over), you need to set up each page’s SupportedOrientations property to do so as follows. Set the default value in the Orientation property. **NOTE: As reader Andy Wilkinson pointed out in a comment to this post, I’m not following best practices here. The way I declare my CameraCaptureTask could lead to problems with tombstoning. He points out a nice article on MSDN that explains the proper use, please read it here. Thanks, Andy, for the assistance! **Another Note: Another user asked about saving the results of the CameraCaptureTask. So I’ve written another post that you may find useful. Please check it out here. After the picture is taken, you can access it later, as a Stream. You can assign it to an Image, save it, or do whatever you want. Of course, you want your application to react when users use common phone Gestures such as Flick, Pinch, Hold, etc. Doing so is easy too! The Silverlight Toolkit for Windows Phone (mentioned in second tip above) provides the GestureListener that you will need. You can see how simple it is to wire up in the following example. In this case, I want the user to be able to hold their finger down on an image to go to “edit mode” where a description TextBox will appear. In the NoteHold() method (not shown), you can imaging all I need to do is set the description TextBox to be visible. Now go start creating apps! Posted in .Net, C#, Silverlight, Windows 7. If you’ve been searching the web for a good sample of how to drag and drop data from one DataGrid to another in Silverlight, you’ve probably found some great samples out there, showing “how easy” it can be by just surrounding your DataGrid with DataGridDragDropTarget tags. In fact, if you do that, you can drag and drop data from one grid to the other. The problem is that most of these demos are about the visual aspect of drag and drop. But in the real world, there is more work to be done. Most of the samples that I found did not deal with how to save the data once it was dropped in the other grid. I’m using the MVVM pattern so basically what I need to do is, once the drop is complete, update my ViewModel. The tricky part was figuring out what information was actually dropped on my target DataGrid. It’s not at all obvious how to do that. The Drop event uses DragEventArgs which has a Data property. You’d think this would be the data from the other DataGrid, but you’d be wrong. Data has a GetData() method but you need to provide it a parameter specifying the format of the Data. Once you figure out how to do that, you’ll find that GetData() doesn’t actually give you the data! It give you ItemDragEventArgs, which also has a Data property. Is this Data the data you want? Not exactly, but you are getting close. This Data can be cast as a SelectionCollection – that is because a DataGrid supports multiple selections at the same time! And each Selection in the collection is the data you actually want. Is it me, or is that pretty confusing? I wouldn’t have gotten this far, but searching the web for a while, I stumbled across a post on StackOverflow that was helpful. The response also references a blog post found here as well. Those samples I found were really helpful but it seemed like it could be made easier. Starting with sample code from the blog post mentioned above, I created a very simple, reusable, Extension Method that uses Generics and does all of the heavy lifting for you! This should make things pretty easy now. Here is some of the sample code and a sample solution is attached here. // Get the dropped data from the Data property and cast it to the first format. Here is the XAML for the two grids. Note that in this sample (you can change this of course) I’m using AllowedSourceEffects.Copy so that the data remains in the first grid and is copied to the second. Lastly, here is the code behind piece that handles the Drop event, get’s the data and passes it to my ViewModel. Note here that I specify e.Handled = true. Without that, the DragDropTarget would automatically copy the data again. First, here is the code that I THOUGHT would work, but did not. Good luck with your WriteableBitmaps!